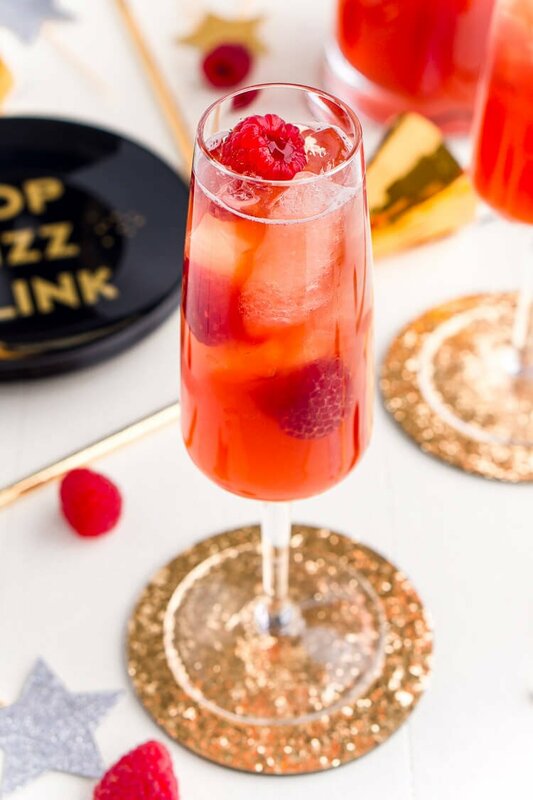 This New Year’s Eve Champagne Punch for a crowd will be the star of the party and likely won’t make it to midnight before the bowl is empty – it’s THAT tasty! Wow, guys, we are definitely looking at the end of the year, how did this even happen? I know I say this every year, but this year definitely went by in a blur. Like most years, this one had its good and it’s bad, but I must say this was definitely one of the best years for me personally! I got to travel to so many wonderful places, it was my first year working from home, and I found myself smiling more overall. JUST TAKE ME TO THE CHAMPAGNE PUNCH RECIPE ALREADY! 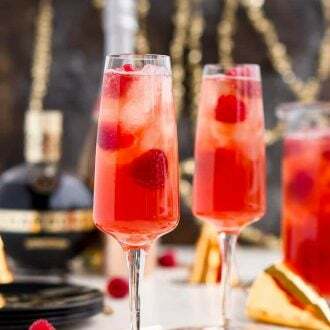 If you’d rather skip my (very helpful, I think) tips and tricks, essential cooking info, and similar recipe ideas – and get straight to this deliciously easy Best Ever CHAMPAGNE PUNCH Recipe – simply scroll to the bottom of the page where you can find the printable recipe card. How did the year treat all of you? I hope it was a good year for you too, but I know that isn’t always the case. Two of my closest friends had a year of struggle and loss and I’m thankful that my year gave me the flexibility to help them where I could. It was also a reminder that we must not take anything for granted because life can change and end in the blink of an eye. But enough with the philosophical talk, no matter how the year went, I’m sure we’re all excited to ring in a new one in! A fresh start. 365 new days and 365 new chances. What plans do you have for the upcoming year? Will next year be the year you leave that dead-end job? Graduated college? Get married? First baby or grandbaby? Take your first international or solo trip? Seriously, I want to know! 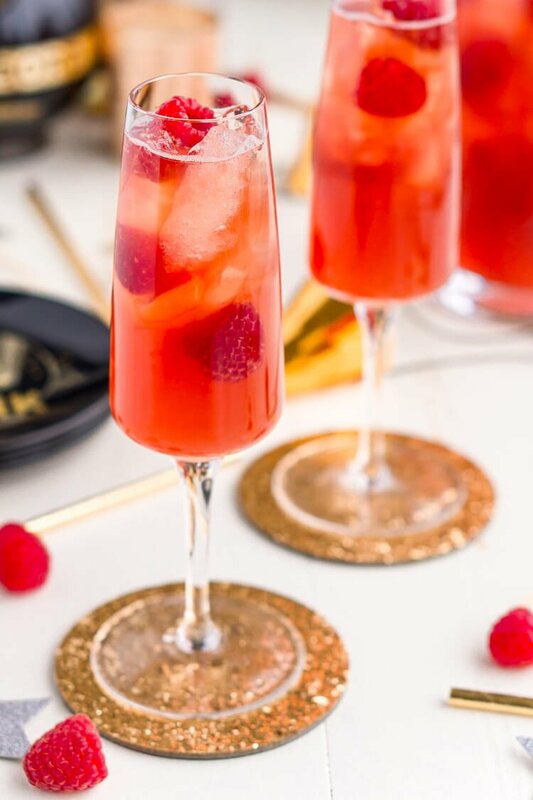 This New Year’s Eve Champagne Punch is loaded with boozy goodness and definitely isn’t one that can be made non-alcoholic. But if you are looking for non-alcoholic punch recipe, try this Cranberry Apple Raspberry Punch. 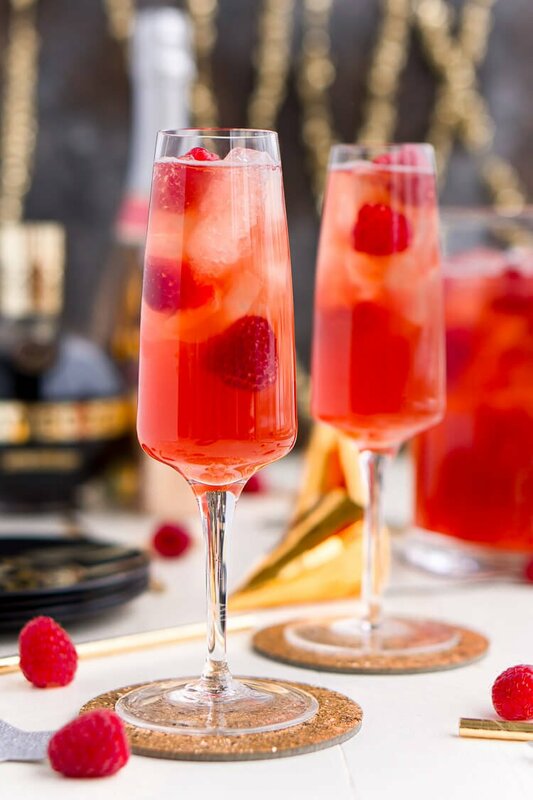 This Champagne Punch recipe so super easy to make, just like most punch recipes! The key to getting the best flavor is to make it well in advance to let the flavors meld. And hold off on adding any carbonated ingredients until just before serving! This will result in the best punch experience. Just before serving, add the Triple Sec mixture, ginger ale, and the champagne together in a large punch bowl. 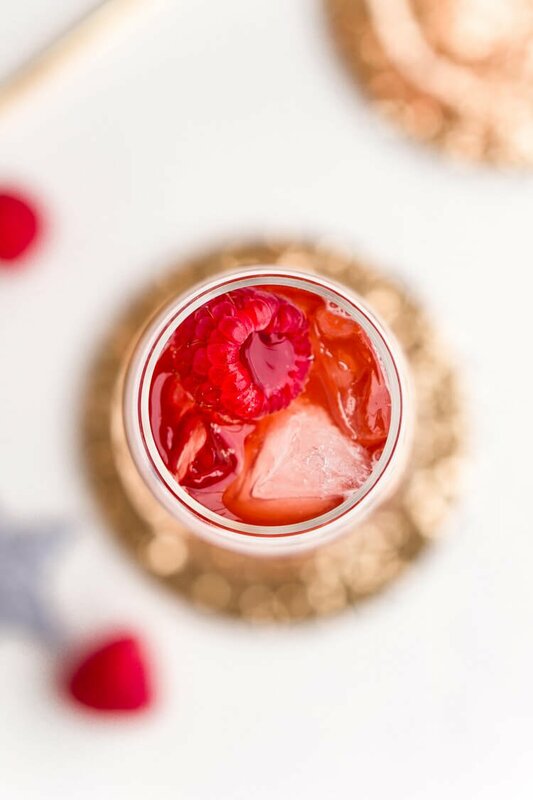 Serve over ice and garnish with fresh raspberries if desired. 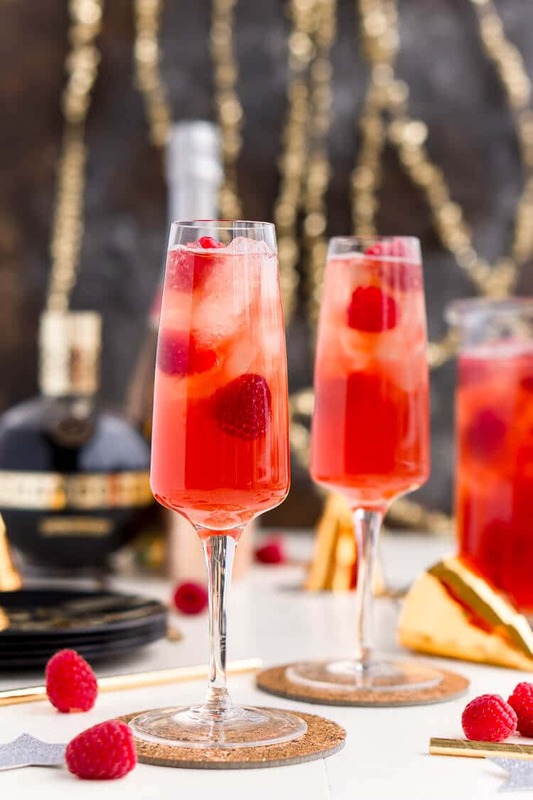 For the most part, this Champagne Punch’s ingredients are very affordable, but it does have Chambord in it. Chambord generally runs around $25.00 per bottle. But don’t worry, I have a few other recipes that use Chambord like these Sangria Slushies and Rosé Berry Sangria so that pricey little bottle doesn’t go to waste! I want to thank you all for following along with me here this year, whether this is your first visit or you’re a regular, CHEERS TO YOU! I highly recommend you go make this delicious, slightly upscale, Champagne Punch! And if you’re not hosting but instead looking for the perfect hostess gift for NYE, check out these adorable DIY Foiled Champagne Bottles! More New Year’s Eve Ideas! 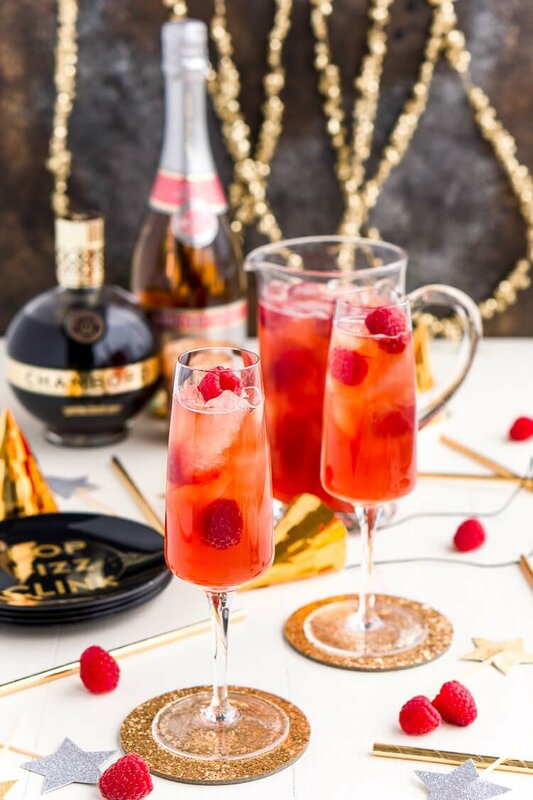 New Year's Eve Champagne Punch is loaded with Triple Sec, blackberry brandy, Chambord, pineapple juice, ginger ale, and champagne for a drink that's sure to impress all your NYE party guests! The longer the first mixture sits, the better the flavor. Oh heck to the yes! This looks like the perfect way to ring in the new year! And soooo pretty too. Picture perfect! This is such a pretty cocktail! Perfect for ringing in the New Year! This looks like a perfect adult party drink. This cocktail is beautiful! Perfect for my New Years Eve party! My family would love this for the new year! Looks absolutely pretty! Creme de Cassis is a cheaper substitute for Chambord. I’ve never made the recipe with Creme de Cassis which has a black currant flavor unlike the raspberry of the Chambord, but I’m sure it would be fine.